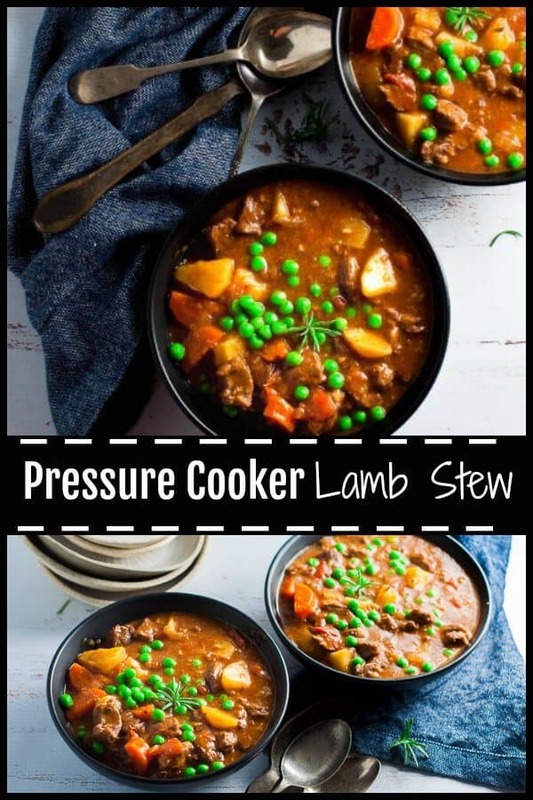 This is a Pressure Cooker Lamb Stew with a tomato base, fresh rosemary, onions, carrots, potatoes and peas. 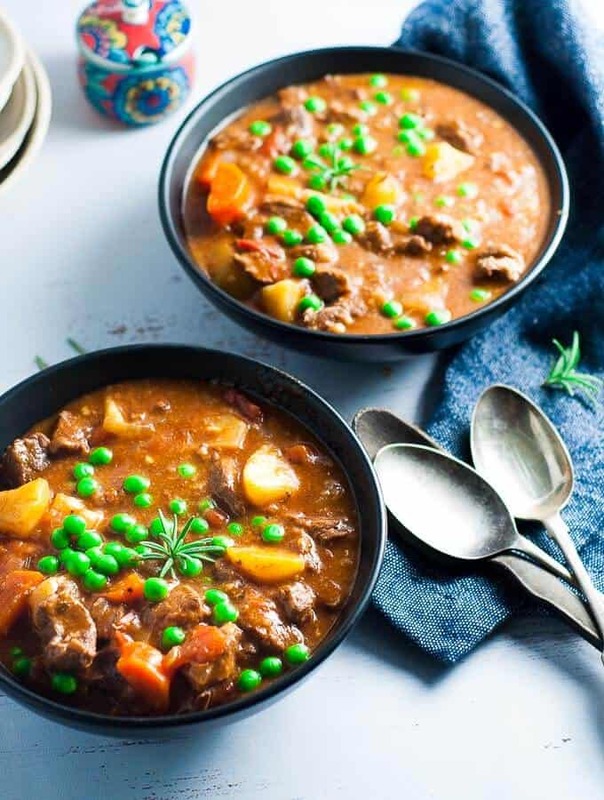 It takes less than 30 minutes to create a flavoursome meltingly tender lamb stew with rich thick gravy like sauce that is perfect to make ahead in the cooler months so you have healthy comfort food on tap. No takeaways needed. 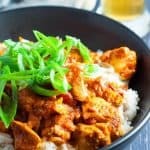 If you don’t have a pressure cooker, you can still make this recipe with the same ingredients either using your slow cooker, on the stove top, or in the oven. Cook in the oven in a casserole dish with a lid for 60 minutes at around 180 fan forced. 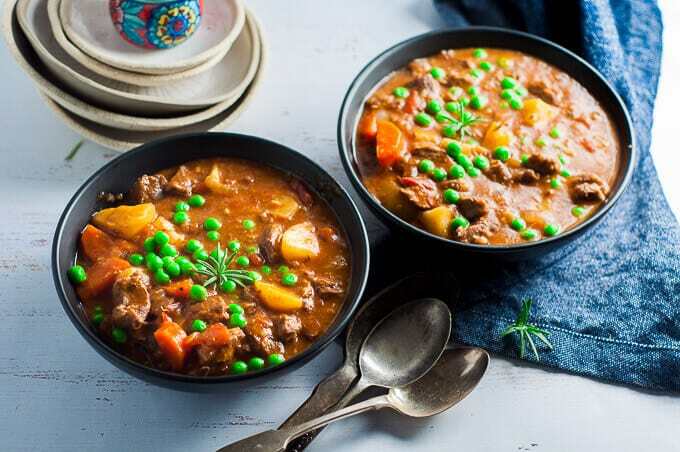 Lamb stew is true comfort food and so filling. One of the reasons I love making this dish is that it freezes really well, so I when I make a batch on a Sunday afternoon, I’ll portion it out into freezer containers, wait for it to cool down a bit and freeze. They’ll be good for 8 weeks. Side note: we all know that lamb and rosemary go together like Ben and Jerry, but hey you could equally use another type of meat and herbage, keeping everything else the same. 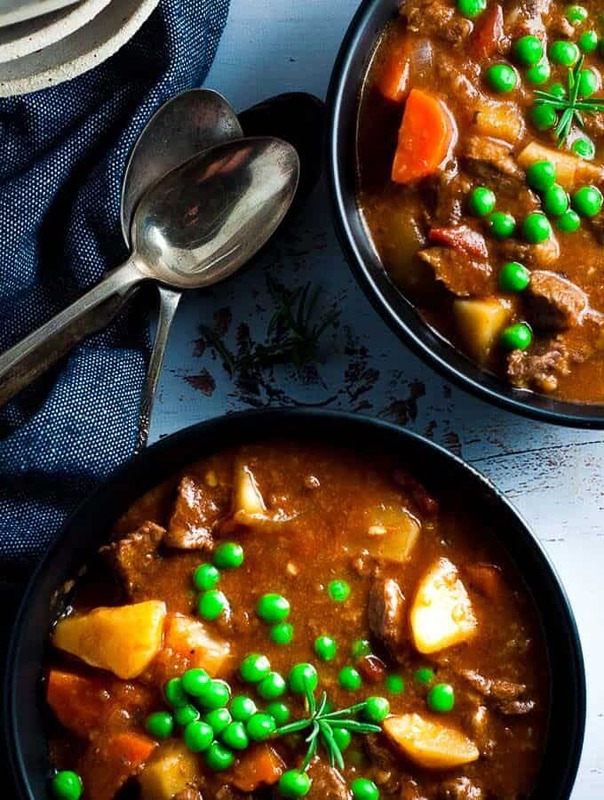 I must confess I have been eating quite a few stews lately with the drop in temperature here on the Sunshine Coast. Cool in the mornings and evenings, just enough to get the Ugg boots and winter woollies out. Thankfully though it’s still pleasant enough to go out early on a Sunday morning to the beach to have our Acai bowls from our favourite café. Usually we take the dog, grab a coffee and sit on the beach eating our delicious and very cold fruit laden acai bowls. They are one of the things I look forward to every second week with my husband when he is home from work. It’s kind of our thing. Brown off the lamb before adding the rest of the ingredients. This applies regardless of whether you’re making this dish in the pressure cooker, slow cooker, stove or oven. Browning the meat, seals in the flavours and helps to develop a stew with more interesting layers. 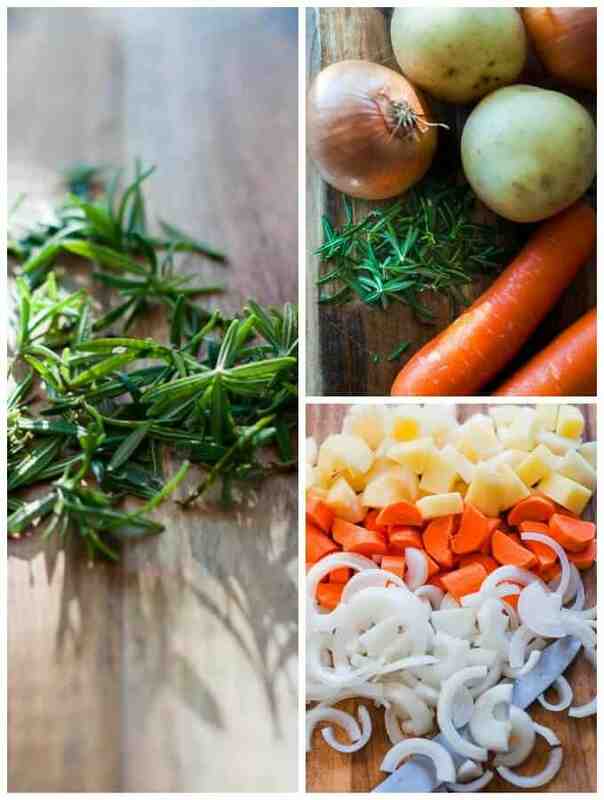 Use fresh herbs. 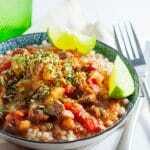 It makes all the difference and adds a real freshness and lightness to the stew. 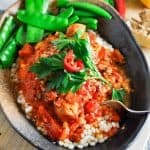 This is a winter family favourite, full of nutritious vegetables, high in protein and low in fat. I tend to find that this is a meal in itself and I don’t need any other sides or bread, but if you’re really wanting to treat yourself, there is one thing that hands down beats everything else: crusty garlic and herb bread you can pull apart and dip in the sauce as you chow it all down. 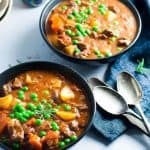 Easy comfort food Pressure Cooker Lamb Stew with a tomato base, fresh rosemary, onions, carrots, potatoes and peas. 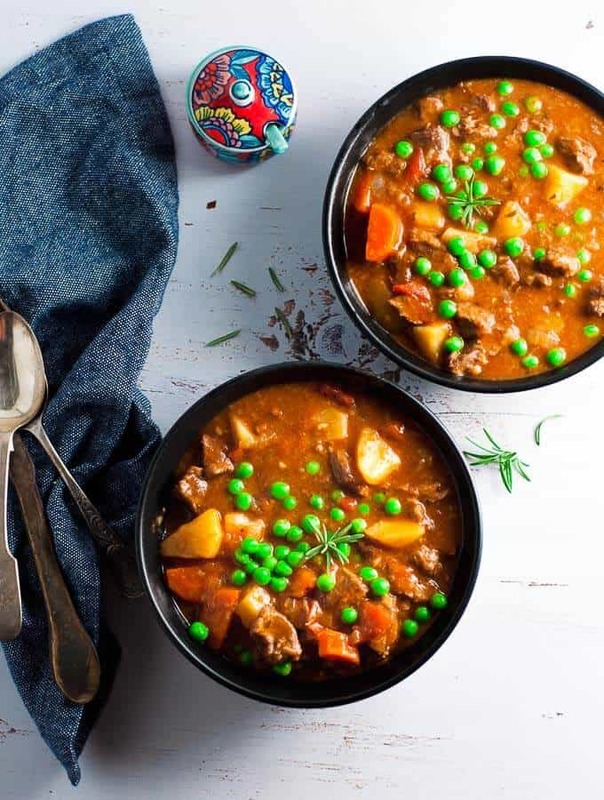 30 minutes to create melt in your mouth tender lamb with rich thick gravy sauce and healthy veges. Make ahead and freeze for weeknight dinners. Set pressure cooker to the “Saute/Sear” HIGH TEMP. Wait a minute or 2 for it to heat up. Remove the meat onto a plate and add the second lot of meat and repeat. 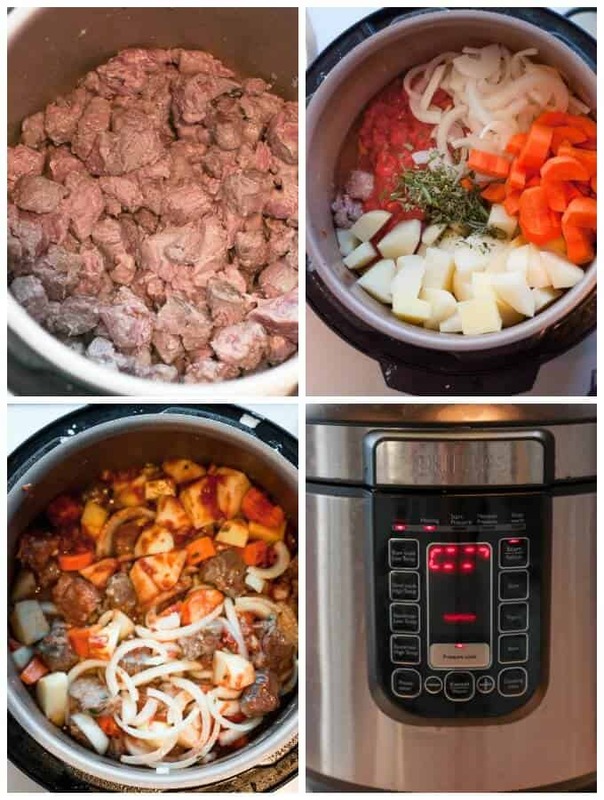 Add all the meat back into the inner pot, along with tomatoes, onions, potatoes, carrots, tomato paste, rosemary, stock/broth and salt and pepper. Secure and lock in lid in clockwise direction. Set the valve to seal. Select the “MEAT/POULRTY” setting and adjust the cooking time to 20 minutes. Press start to commence the cooking process. Once timer has gone off, release pressure valve so steam can escape. 10. Remove lid and stir the stew. 11. Wash frozen peas under hot water for a minute and shake off the water. Add peas to the stew and stir in. 12. If thickening is required: make a cornflour slurry by adding the cornflour and water in a small cup, stirring to combine. Stir the cornflour slurry into the curry and stir to thicken.